A board book with movable parts especially for little ones moving into big-siblinghood. The book’s sturdy pages open top to bottom to display a vertically oriented baby with peachy skin that early text invites readers to massage. On the bottom of the first spread, readers are invited to “Put the diaper on Baby and fasten it,” and the illustration is equipped with flaps that lift up and tuck into slots in the diaper’s waistband. 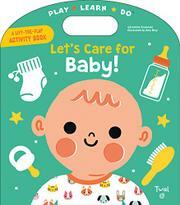 Movable nail scissors glide back and forth to trim the baby’s nails, and an ear thermometer with a slider to reveal the digital measurement of the baby’s temperature offers another chance to manipulate and interact with the book. Ensuing pages with similar movable parts invite readers to dress, wash, and feed the baby, while the final spread tells them to “Tuck Baby into the sleep sack.” While most parts of the book are impressively durable, a few fragile elements (small buttons on the bodysuit and the aforementioned diaper fasteners) will likely provoke warnings to be careful and are unlikely to stand up to enthusiastic little hands. Nevertheless, the book’s bold illustrations and inviting interactivity will surely make it a hit with many new and soon-to-be big brothers and sisters, not to mention any baby-fascinated toddlers.